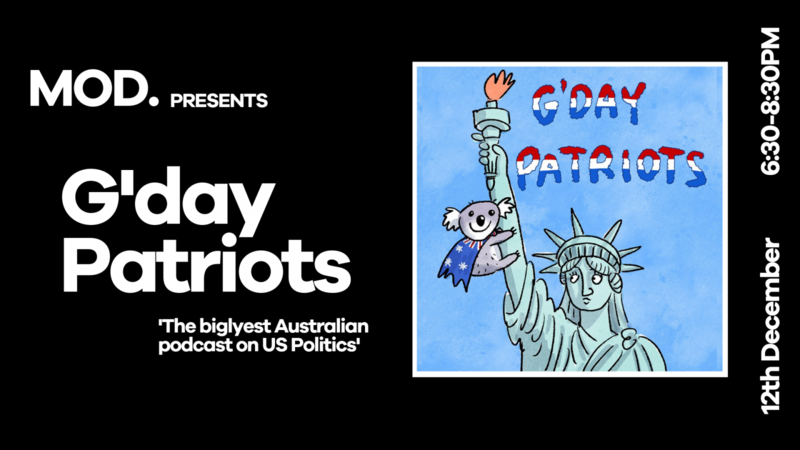 Come and be part of a live recording of G’day Patriots, the biglyest Australian podcast on US Politics. Covering the current events in US politics, the show will also explore the brand that is President Donald Trump, the emergence of ‘fake news’ and the role of propaganda in the Trump White House. The podcast is hosted by Deb Mewett, James Cahill, The University of Melbourne School of Politics and Dr Will Grant & Dr Rod Lamberts from ANU. The podcast began modestly in a bunker near the little Kaleen shops in January 2016 and quickly garnered a strong following and hosting the US Embassy 2016 Election event in Canberra. Sound magician Craig Greening brings it all to life, and friend of the pod, Jon Kudelka, provided their wonderful image. ++ we are also offering workshop & podcast tickets. Come along to the workshop and learn all things podcast at 10:00am with hosts Deb Mewett and Craig Greening as they delve into how to get the most out of content and marketing for your podcast and the technical aspects of hosting, and recording.